Hello, everyone, and welcome to the Rev Up. Round nine is already here folks! With the second half of the series upon us only nine points separate the top two rider in Monster Energy Supercross’ 450 class. Three-time defending champion Ryan Villopoto has held the lead since the second round of the tour and we are heading to a venue that the Monster Energy Kawasaki pilot has dominated four years in a row. This considered, Lucas Oil Stadium in Indianapolis, Indiana could prove to be a pivotal venue in the series. As the second stop in the East Coast swing, Indy is always a huge event. While Atlanta draws a great portion of the Southern contingent of fans, Indy brings fans in from as many different states as any stop on the tour. From Michigan to Ohio, to Illinois and Missouri we always see a gigantic crowd at the Hoosier State supercross. In addition, its hard to type too many words about Indiana without bringing up Mike LaRocco. A future AMA Hall of Famer, “The Rock” won his last supercross in Indianapolis and you will encounter more than your fair share of LaRocco jerseys in the pits and in the stands. This stop marks round three of the 250 East Region divisional contest where rookie Adam Cianciarulo owns a two-point lead over his Monster Energy/Pro Circuit Kawasaki teammate, and previous round winner, Martin Davalos. Furthermore, Blake Baggett, the third member of the Pro Circuit juggernaut sits third in series points. In the premier division, a curious story is beginning to develop between a pair of riding and training mates who sit atop the standings. Let’s take a look at both classes, and get Revved Up for Indy! There are several themes associated with the top three in points in this class. Leading the way is the rookie who carried a mountain of expectation and hype around his series debut. That noted, Cianciarulo’s performance thus far is smooth, steady and fast. He is aggressive in practice, pulls holeshots in his qualifiers and has ridden 30 very un-rookielike laps to begin his indoor career. He had a big crash in his heat race last week, but put it together when it counted. Hot on his heels is the veteran, Davalos, who is likely racing the last 250 series of his long career. He has easily had the most speed through two rounds and after finally knocking down a win in Atlanta, many are speculating that he could streak away with the championship. I’m going to hold off on that notion until he gets out of Indy with such banter. If he wins again, lookout. In third we have Blake Baggett, who is trying to shake his “outdoor guy” moniker. Keep in mind that the first win of Blake’s career was the 2010 Dallas SX and he has been fast so far in 2014. He’s had some more time to ride and race into shape after his pre season injury and Indy could serve as a statement race if he is able to win. Behind the top three sit a trio of Hondas with three similarly different stories. Oklahoma’s Justin Bogle put his GEICO Honda on the podium last week and is another guy on the comeback trail following injury. Bogle has a lot of talent and with some confidence and a good start he can break up the Pro Circuit party again. Behind him sits the privateer (Factory Metal Works/Club MX) Honda of Vince Friese who has been impressive through two rounds. Vince just needs to keep riding well and continue to avoid drama. If he can do that, he stands a chance to get some more support in 2015. In fifth sits a sleeper in Blake Wharton who showed some real speed in Atlanta. Wharton’s last appearance in Indy was one of heartbreak as he dominated the main event before throwing it away huge on the last lap in the whoops. A sweet redemption song it would be if Wharton wins this weekend on his GEICO Honda. Another interesting note about Indy ‘13 was the podium finish of Kyle Peters. There are some riders like Rockstar Energy Racing KTM’s Cole Thompson, Texans Matt Lemoine and Kyle Cunningham, and of course the embattled Yamalube Star Racing Yamaha sophomore Jeremy Martin who will be looking for a breakout race. The big story all week has centered around the riding and training relationship between the riders sitting first and second in points. Can they continue to be buddies? I see two scenarios: One, Ken Roczen makes a mistake, has a bad round and Ryan Villopoto gets away. Two, they fight tooth and nail for the title belt all the way Vegas. One has a happy ending, the other not so much. It is going to be tough, because 3rd and 4th are so far back in points that for now it is simply between Kenny and Ryan. Can they hug it out all the way through? If they do it will be a monumental victory in sportsmanship, as well as the first time I have seen such a feat in all of professional motorsports. It’s a great battle between the two with almost polar opposites colliding. The veteran vs. the rookie, the German vs. the American, Thor vs. Fox and KTM vs. Kawasaki. As I mentioned above, this could be a very pivotal round. Villopoto hasn’t won since Oakland, but if he is able to win his fifth consecutive SX in Lucas Oil Stadium we’re heading into a dangerous part of the series for anyone without a #1 on their bike. Yoshimura Suzuki’s James Stewart and Red Bull KTM’s Ryan Dungey are the racers most likely to get some points back from the two front runners. For Stewart, Atlanta was very rough as his 11th place finish took the wind out of his championship sails and he will need Ken or Ryan to stumble if he is to catch them. Quick history back to Indy in 2013 shows he was leading the main event before falling over. It’s the same story for #7: if he keeps in on two wheels he can win. 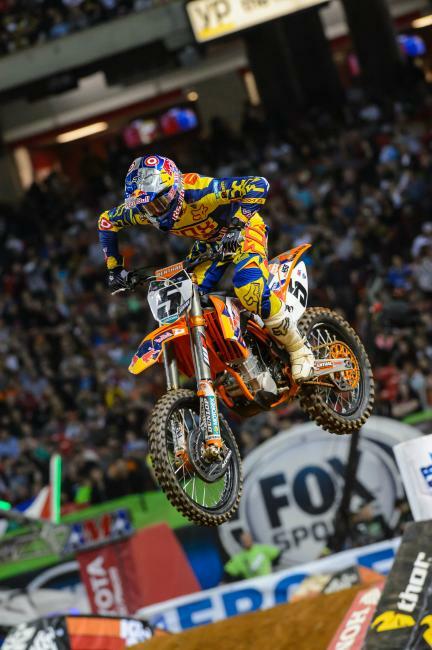 On the other hand, Ryan Dungey needs to find a little extra speed to find victory. Last week he watched his rookie teammate inch away through the 20 laps and that has to sting. Dungey tried to push that little extra through rounds 3-5 but he experienced crashes. He has been steady the past two weeks and it might be time for him to pour it on again. He is the only rider with two Nuclear Cowboyz holeshots so far, and another could spur him to victory. The Dunge needs a win. As for the others, Justin Brayton refuses to finish out of the top five and is riding the best SX of his career. With two whoop sections gracing the track once again, this is another opportunity for Brayton to put his JGR Toyota Yamaha on top of the steps. 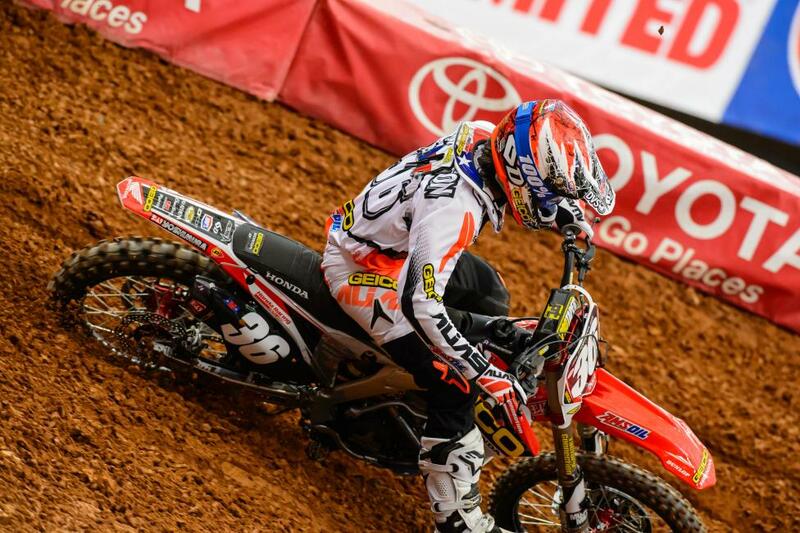 Beyond him, GEICO Honda’s Wil Hahn has been riding great and finally getting his signature good starts. 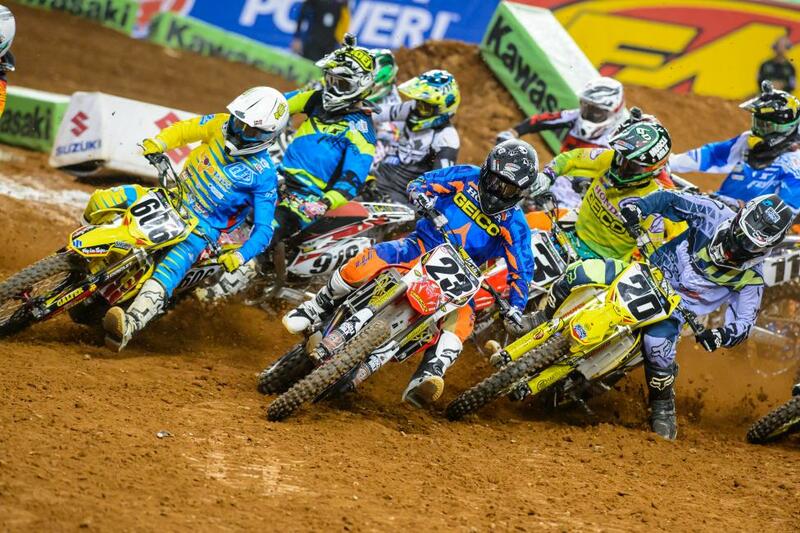 I’m actually calling #23 for the holeshot this weekend. As for dark horses, look for Muscle Milk Honda’s Justin Barcia to rebound and perhaps it’s time for Josh Grant to have a good main event. It looks like we have a creative track design for the second week in a row and the sand section is back, which always produces a challenge. The championships are tight in both divisions, and for the 9th consecutive Saturday night we can expect some awesome supercross racing! This event should be a sellout and Lucas Oil Stadium will be loud. Will Roczen surprise again and inch closer to the point lead? Can Stewart shake off the misfortune in Atlanta and become the first three-time winner of the series? It was one wild night the last time we visited Indianapolis, and there is a whole lot of energy floating throughout the pits right now. Time for the Indy SX!